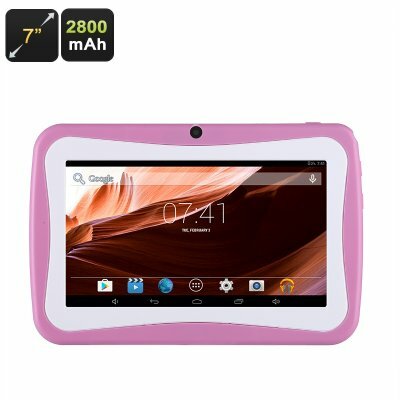 Successfully Added 7 Inch Android Tablet - Kid Friendly, Google Play, Micro SD Slot , 2800mAh Battery, 1024x600 Resolutions to your Shopping Cart. 7 Inch tablet PC is the ideal size for young learners. This 7 inch Android tablet PC is created especially for your young ones. It's the perfect size for smaller hands and makes a great learning aid quenching their thirst for knowledge. This 7-inch tablet PC is an integrative learning tool for your kids. With the Google play store installed you have access to a wealth of knowable games, apps, and quizzes. These will put your little prodigies through their paces and introduce new topics while also shaping their understanding of technology and help make them computer literate. At 7 inches the tablet offers plenty of screen size for easy viewing yet remains easy to hold and navigate with small hands. It also offers a great way to entertain your children if on a long road trip. The onboard memory and expandable storage via micro SD card slot mean you will have enough storage for movies, games and anything else to keep boredom at bay. This tablet also comes with a splash-proof case and kickstand for better protection and easier viewing over long periods. With their very own tablet PC, your kids will be able to interact with friends, watch their favorite shows and even Skype chat with family. They can even snap and share photos with you. So no more excuses for borrowing and running the battery down on your phone playing as they will have a device of their own. This 7-inch children friendly tablet PC comes with 12 months warranty, brought to you by the leader in electronic devices as well as wholesale Android tablet PCs and kids gadgets..